1. Heat a small saucepan over medium-high heat. 2. Coat pan with cooking spray. Add corn, zucchini and onions to pan; sauté 4 minutes or until vegetables are crisp-tender. Remove from heat. 3. Heat a 10” nonstick skillet over medium-high heat. 4. Combine water, pepper (or Mrs. Dash®), egg whites and egg in a bowl, stirring well with a whisk. 5. Coat pan with cooking spray. Pour egg mixture into pan; cook until edges begin to set (about 2 minutes). 6. Gently lift the edges of the omelet with a spatula, tilting the pan to allow uncooked egg mixture to come into contact with the pan. 7. Spoon vegetable mixture onto half of omelet, sprinkle cheese over vegetable mixture. 8. Loosen omelet with a spatula and fold in half. 9. Cook 2 minutes more or until cheese melts. 10. 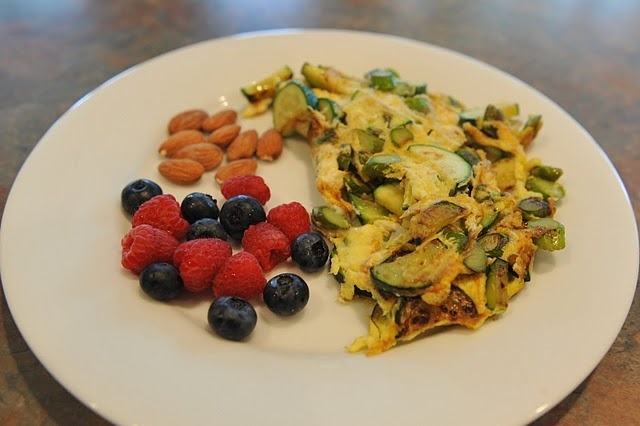 Carefully slide omelet onto a plate.